Thomas McGinty is the International Trade Administration’s National Director for U.S. Operations. What does the director of the Salt Lake City U.S. Export Assistance Center (USEAC) have in common with a former Utah governor and a former director general of the U.S. Commercial Service? They are all recipients of the annual Utah International Person of the Year Award. I was thrilled to learn that Dave Fiscus, director of our Salt Lake City USEAC, recently received the 2015 Person of the Year Award for going beyond the call of duty to promote trade and help Utah companies succeed in international markets. 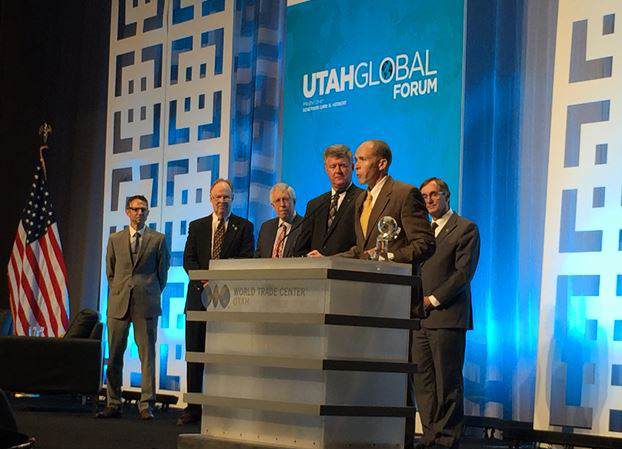 The award was presented to Dave by KeyBank and the World Trade Association of Utah. This is a tremendous honor and professional achievement for him and the entire Commercial Service family. We challenge our employees to ‘Dare to Be Great’ in creating opportunities for U.S. businesses and promoting exports. I congratulate him for his outstanding work in Utah. Terry Grant, president of KeyBank in Utah and member of the nominating committee, commended Dave for his deep engagement in the Utah business community, particularly his outreach to rural companies and the support he provides to state and World Trade Association events. This year, the governor led five trade missions and Dave played a major role in planning and executing each of them. Mr. Grant attended several of the missions and noted that the Gold Key meetings organized by Dave were extremely valuable in connecting Utah exporters with prospective overseas clients and partners. Dave was also instrumental in recruiting 130 foreign buyers for the first time ever to attend this year’s Outdoor Retailer Summer Market trade show in Salt Lake City—100 more foreign buyers than the show organizer expected. Background reports on potential distributors, agents and partners. To find an Export Assistance Center near you, visit Export.gov.